On the 11th March 2018, family and friends of Merv Doidge, who died at Peace Hospice Care's Inpatient Unit in August 2017 following his battle with cancer, will be walking in his memory. The group, along with more than 180 other people will be walking 10 miles and crossing 12 bridges at the Hospice's London Bridges Walk. 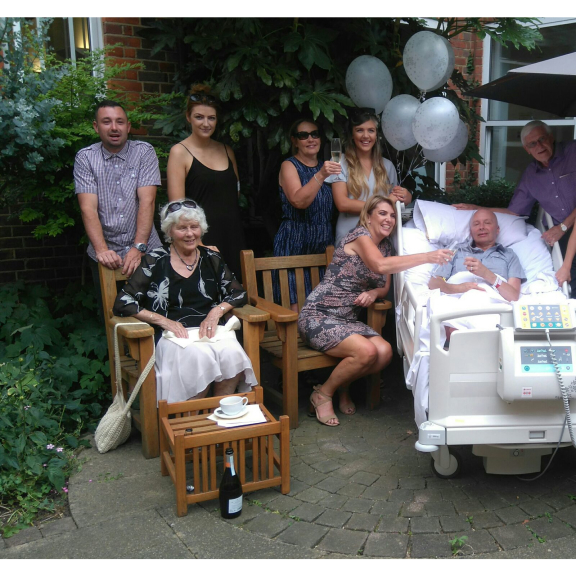 While at the Hospice, Merv married his fiancée, Tracey Davies, from Bushey. Tracey said: "Our wedding day took place on a beautiful, sunny day - the flowers were in full bloom as the ceremony took place in the central garden. The staff helped me arrange the wedding. I remember the smile on Merv's face - he looked so happy. "All the staff at the Hospice were amazing. There was always a hug or shoulder to cry on if needed, and the times when Merv and I wanted to be alone were respected. It's truly an amazing place - not just for patients but for the whole community. "The charity relies so much on donations just to survive and on Sunday 11th March (which would have been Merv's 55thbirthday) many of us are doing the 10 mile London Bridges Walk to raise funds for the Hospice and hopefully have a good day too!" Spaces for the London Bridges Walk on Sunday 11th March are limited. This year, for the first time, the walk includes a history trail and quiz which will make it a great family friendly event.